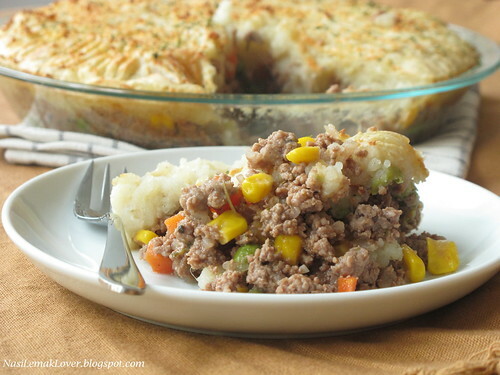 I just learnt that a Shepherd’s Pie is made from ground mutton/lamb where a Cottage Pie is made of ground beef. 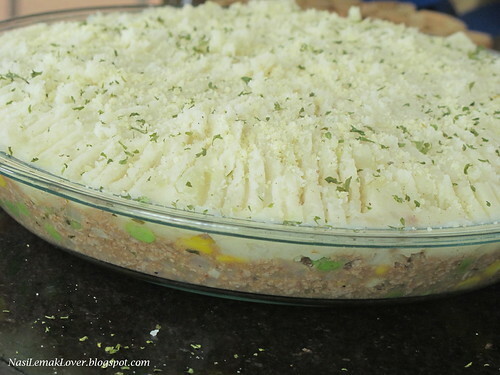 So today I preparing a British classic-Cottage pie but not a Shepherd's pie. This is a delicious and comfort meal~ I'm preparing this for lunch, my kids love it! 2. Mash the potatoes, add in milk and season with salt and black pepper. 1. Heat Olive oil in a pan. 4. Add in minced beef, stir well. 5. Add water and all seasonings, cook till sauce has thickened. 1. Spoon cooked minced beef in a 9” round baking pan. 3. Fluff up the mash potato with a fork to make rough peaks. 4. Sprinkle Parmesan cheese powder and parsley flakes on top. 5. Bake in the 180˚C pre-heated oven for approximately 25 mins, and brown the top at 200˚C until golden brown. Hey, your internet connection is back oredi eh? I see you posting as often as before now. Looks good and yummy! I'm not into mutton or lamb, but I don't mind beef. I would love this pie very much because of the ingredients ,they are all my favourite . I love the potatoes on the top, so yummy! Great looking pie! We don't eat mutton so this is something that I will make. YUM! I like the idea of sprinkling parsley flakes on top! Looks so yummy, no wonder your kids love it! Looks yummy, but can I change it to pork or chicken, coz my kids won't eat beef but they like potato. That's lovely cottage pie, I made this too with minced chicken. wow! cottage pie! my favourite, very hard to find good ones in spore! ur big cottage pie can be eaten for breakfast, lunch, dinner, supper! Sonia, this looks SO SO GOOD! I would change the beef to pork or chicken too. This will be the next pie to make on my list. See you tomorrow dear. no beef or lamb for me but i love the potatoes topping hat you made on them! 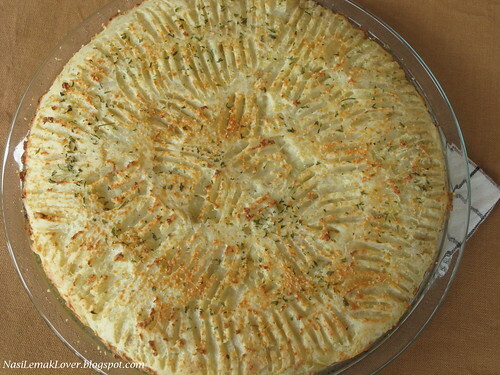 Looks great with the pattern you made on the smashed potatoes. I never knew the difference until now ... Well, I guess it's because my tastebud's too Asian ;). This doesn't mean that I don't enjoy other types of food, I do, but living far away from home makes me want to eat Asian food very regularly... Your cottage pie looks beautiful by the way...! When I was a kid my mom made something like this. She called it hamburger pie...we just called it good! First time here..you have a lovely space with some great dishes...Glad to follow you. 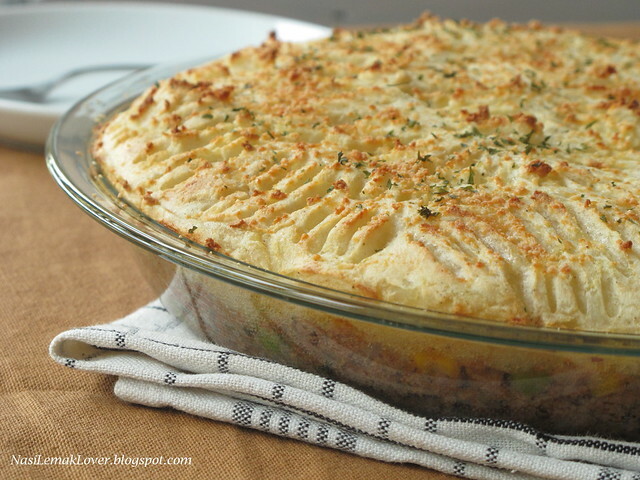 Cottage pie looks so yummy and delicious!